Fourteen IP hosts VIP Club Christmas lunch and awards, followed by Rogue One Screening. 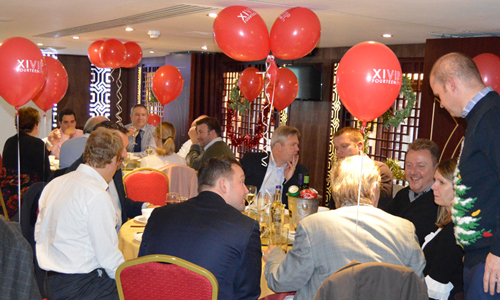 The Fourteen IP VIP Club, XIVIP, met for its Christmas lunch and awards ceremony in December followed by a screening of the latest Star Wars movie, Rogue One. XIVIP Club members were invited to lunch in a private room at the Golden Phoenix, in London’s China Town, where we all enjoyed some amazing Chinese food and the odd glass or 3 of wine. The meal was followed up by some alternative Hospitality Industry Awards presented by Fourteen IP MD Neil Tolley rewarding the hard work and commitment to the industry that many of the XIVIP members had made. The awards included the Best Beard in the Industry, which went to Peter Anderson from Ginger Beard Consulting. Lunch and awards was followed by a short stroll to Leicester Square where we were met but a number of Star Wars storm troopers, before watching the newly released Star Wars – Rogue One in 3D at the Odeon IMax. A few of the pictures can be seen below, XIVIP members can see the full set here.